My thanks go out to Derrick Belanger for my copy of this book. 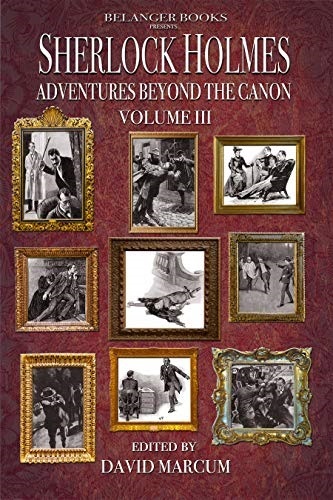 I am going to assume that readers of this volume will be already familiar with the Holmes canon. I am using the Holmes story abbreviations from this site. Readers of Sherlock Holmes might often ask what happened after Holmes solved the case, or where Holmes might have crossed paths with a villain before the current case. That is the premise of this volume. Occasionally in the canon, the story seems incomplete. This could be because there is obviously so much more to the tales offer a glimpse behind the scenes. Sometimes a tale is explained, sometimes a crook is traced further, and sometimes it is a “how they met” story. David Marcum returns with another volume of great Sherlock Holmes stories. Readers of the MX series of New Sherlock Holmes adventures will find that many of the authors are familiar. Be sure not to skip the Holmes poem by Phoebe Belanger! In accordance with the SPOILER WARNING on page 21, I will be more careful than usual with my detailed review. I will give little beyond what the reader will encounter on the first page of each adventure. And now, on to the stories! I cannot mention the canonical story this one is based on without spoiling the story! Great stuff! Violet Smith of SOLI fame needs Holmes again. I am at a lost for words. Really? I mean really? Holmes and Watson return to the scene of SHOS. It follows well with the original. Good show. Doctor Trevelyan of RESI fame needs a hand forty years after the original story. Not bad!